Home / shops / Boots to open in Avenues Mall next week! 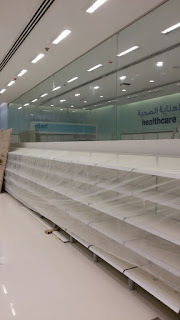 Boots to open in Avenues Mall next week! Some of you may have noticed that the retail unit for Boots in the Avenues Mall has recently been quite active... the fit out of the store is now practically complete, and I understand that the shop will be opening for business next week. So all of you Boots fans can now get your fill here in Muscat instead of Dubai! Oh my face feels better already. Woohoo! Yeh! At last .... so pleased! I gave a girl a facial once, but not in boots. I think I was barefoot.